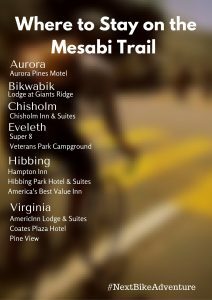 In the Arrowhead Region of Minnesota is the Mesabi Trail towns that offer a variety of biking and other fun recreational opportunities for visitors. A picturesque Mesabi Trail section between Gilbert and Virginia, MN. Made up of several mining towns along the trail, each with unique history, culture, food, and lodging, they are all surrounded by miles of wilderness. Along the way, see the World’s Largest Hockey Stick, Bob Dillon’s home town, and the Minnesota Museum of Mining just to name a few attractions. 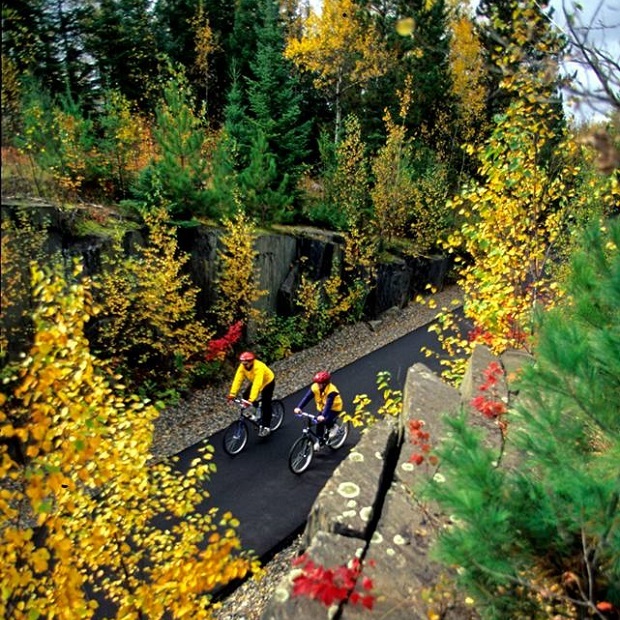 Whatever your riding choice is for the first trip, you will always remember the Mesabi Iron Range and will want to come back. Explore and enjoy the beauty of the mine pit lakes surrounded by forests, in and around the Mesabi Iron Range. This northern trail system starts near the Mississippi River, in Grand Rapids, and meanders east through 25 communities across the Mesabi Iron Range. Riding the trail uses a combination of old rail beds, abandon roads between mine pits, and allows you to go over grassy meadows and wooded areas. For the history buff, the trail and towns here offer a open window of the area’s mining past. Trail riders will pass many man-made lakes from old mines and some iron ore pits that are still-working. For road riding, select many scenic routes that connect with the trail system. For the mountain biker, there are miles of varying terrain through state forests and through old log/mining roads, plus several challenging terrain parks near Hibbing and Virginia. 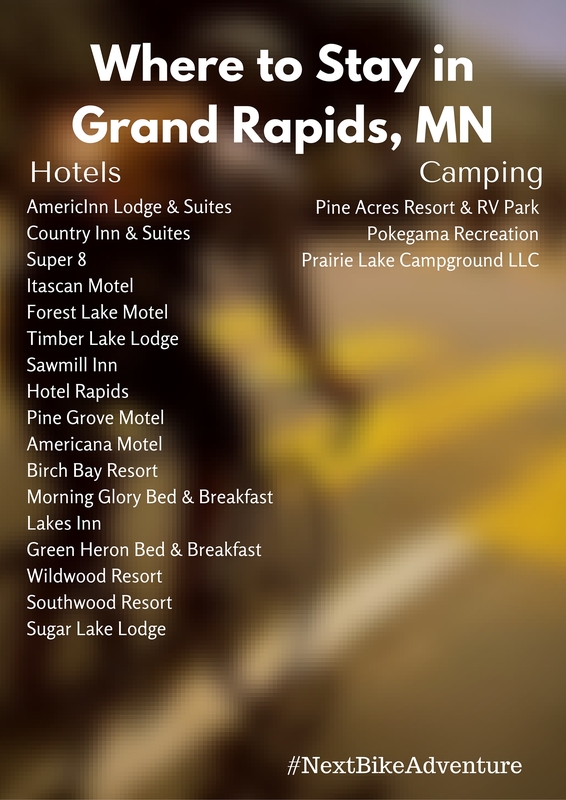 Along with the bike opportunities on the Mesabi Trail, you will also find the Minnesota Discovery Center, Giants Ridge Golf & Ski Resort, several mine overlooks and tours, great restaurants, and lodging. For more info look below to see what each area of trail has to offer. Numerous restaurants, gas stations, and grocery stores are easily accessible. Along each portion of the trail you will find unique and delicious dining options to suit your taste. Check below for more information on each community’s options. Christened by local civic leaders who were inspired by a particularly brilliant display of northern lights high above the new village, Aurora is located on the eastern edge of the Mesabi Iron range. Aurora is a town with a schedule full of festivals. While visiting here, view the former LTV Steel Mining Company from the designated lookout point at the city’s edge. Here you will also find lodging, restaurants, parks, shopping, and a library for Wi-Fi access. Here are a couple of Aurora’s attractions. Riding your bicycle Northeast from Giants Ridge to Ely is approximately 43 miles. The Mesabi Trail has not been totally constructed yet at this end. There is a three-mile section in Soudan and another three-mile section of the trail in Ely. From Giants Ridge you will need to use the paved scenic county roads at the far eastern point of the Mesabi Trail. The name “Biwabik” in Ojibwa means “valuable” and the mines and taconite plant here have certainly made it valuable. With a unique Bavarian look to the downtown area, the Mesabi Trail runs east along the south side of town and along Embarrass Lake. Then, it continues on to the Giants Ridge Golf & Ski Resort. There are restaurants, parks, a swimming beach, and campground nearby. Here are a couple of Biwabik’s attractions. When riding your bicycling on the Mesabi Trail east, it is four miles to get to Aurora. Located on the shores of Trout Lake, Coleraine has one of the original Andrew Carnegie Libraries. Additionally, there is a public beach that is there to sit on to enjoy the warm days to cool off. There are also restaurants, gas stations, and an ice cream shop here. Two miles further east is Bovey where you will find more to discover and enjoy. Three miles further east is Taconite where you will find a public beach at Holman Lake and a grocery store in town. Here are a couple of the area’s attractions. Riding your bicycling on the Mesabi Trail from here, it is six miles to get to Calumet. Boasting the “Finest Water in America,” the Buhl Public Library is listed in the National Historic Book of Register. Here you find a park for camping, a picnic, or a swim. There is a restaurant and gas station in town as well. Be sure to check out this great place. Riding your bicycling on the Mesabi Trail from here, it is nine miles further east to Mountain Iron. Home of the Hill Annex State Park which provides a view of a mine. It also has a museum/gift shop in town. Also, you will also find a public library for Wi-Fi access. Riding your bicycling on the Mesabi Trail from here, it is five miles to Nashwauk. Home to one of the region’s major tourist attractions, “Ironworld,” Longyear Lake is located here within the city limits with a public swimming beach. Other attractions include the Museum of Mining, a WPA Project called the Rock Wall and Museum, Classic Car Museum, Bruce Mine Headframe, and the Iron Ore Miner Memorial. The town has a restaurant, grocery stores, gas station, library, and an option for camping. Check out some of Chisholm attractions. Iron Man Statue in dedication of the Iron Ore area. Riding your bicycling on the Mesabi Trail from here, it is six miles further east to Buhl. A community resting not only on a large body of iron ore, but it also on the Laurentian Divide, Gilbert has parks, a library, excellent camping grounds, and several great places for breakfast, lunch, or dinner. The Iron Range Historical Society, located in the historic former city hall, houses an extensive collection of photographs, family history/biographies, and much more. On a spur of the paved trail, heading south for miles, is Eveleth. A picturesque community and home to the Mesabi Trail Headquarters and Iron Range Tourism Center is just off of Hwy 53 at the trailhead. While here, notice all the natural and man-made wonders. Check out the “Big Stick”, the largest hockey stick in the United States, located in downtown area and the Hockey Hall of Fame along the highway. Here, close to the trail you will find dining, a library, and lodging options also. Here are some of the area’s attractions. Riding your bicycling on the Mesabi Trail east from Gilbert, it is seven miles to Biwabik. Check out the At-A-Glance Article for Grand Rapids. 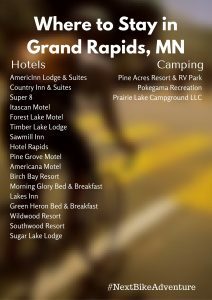 From Grand Rapids, riding your bicycling to Coleraine on the Mesabi Trail is eight miles of gently rolling wooded terrain. Located 40 miles east of Grand Rapids and 25 miles west of Virginia, if you take the trail, you’ll find a great lookout point. At Mesabi Trail access point is the Hull Rust Mine viewpoint lookout point and the Greyhound Bus Museum. Known as the “Town That Moved”, “The Grand Canyon Of The North”, and the “Iron Capital of the World”, this is the largest city on the Mesabi Iron Range. Along with most hotels, coffee shops and restaurants having Wi-Fi availability, the public library is another good option. The Hibbing Public Library is located at 2020 E. 5th Ave. in Hibbing and reachable by phone: 218-362-5959. Riding your bicycling on the Mesabi Trail from here, it is seven miles east to Chisholm. The town of Nashwauk is 28 miles east of Grand Rapids and 13 miles west of Hibbing. The town has a restaurant, grocery stores, gas station, and library. Two and a half miles to the east is O’Brien Lake with a swimming beach. A couple miles further is Keewatin where you will find more places and things to explore. Riding your bicycling on the Mesabi Trail from here, it is eight miles east to Hibbing. West of Virginia, the city of Mountain Iron is where the “Iron Range” began. It was here that Leonidas Merritt discovered ore in 1890. The town still reflects the mining emphasis. Located just south of town is the Minntac Mine Overlook. Here, visitors have a unique chance to view the operation. In the downtown area you can climb aboard the 1910 Baldwin locomotive on display. Here are a couple of Mountain Iron’s Attractions. Riding your bicycling on the Mesabi Trail from here, it is three miles east to Virginia. With two lakes right in the center of town as you pass through or connect with the Mesabi Trail, Virginia offers numerous buildings listed on the National Historic Register showing its pristine past. Located 60 miles north of Duluth and a 100 miles south of the Canadian border, Virginia has natural scenic beauty and many mining attractions and festivals. The Mineview in the Sky gives visitors a 20-story view of the Rouchleau Mine group, the area’s deepest mine. Along with most hotels, coffee shops and restaurants have Wi-Fi availability. Additionally, the public library is another good option. The Virgina Public Library is located at 215 5th Ave. South in Virginia. They can be contacted by phone at 218-748-7525. Here are a few of Virginia’s attractions. Riding your bicycling on the Mesabi Trail from here, it is seven miles east, up the beautiful rock edged rail-trail, to Gilbert. This entry was posted on June 14, 2016 by Russ Lowthian.